Photo: Courtesy of Cy Fredrics Jewelers. If diamonds are a girl's best friend, how well do you know your carats? 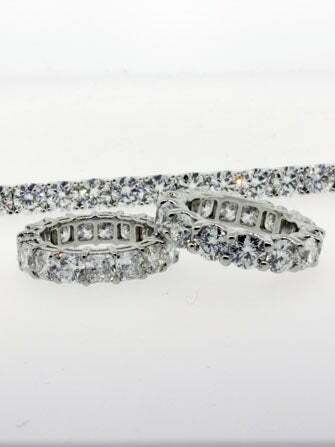 Put your glittering knowledge to the test at Cy Fredrics Jewelers between now and Monday, September 30, and you could walk away with some serious Zsa Zsa Gabor-like bling. In honor of the North Shore jewelry store's 55th anniversary, you're invited to guess the amount of carats in a celebratory Champagne flute. You need not travel to the store to participate either — which means you non-Chicagoans can participate, too! Simply check out this snap on the Cy Fredrics Facebook page and submit your guess here. The first contestant to submit the amount closest to the actual number will score $1,000 worth of merchandise — cha-ching! So, whether you want to put your potential winnings toward a gift for that someone special or treat yourself, your guess is as good as anyone else's!